You know how we like to have folks videotape their baptism stories ahead of time and show them at the baptism service? Baptism is an incredible step in the life of a believer. It's a symbolic time to identify with Jesus Christ and publicly proclaim that we place all of our hope in him alone. Some are intimidated by the idea. Maybe it's the thought of being in front of a group of people dripping wet. Maybe it's the public confession of faith. Some hesitate because they aren't sure what they will say. Objections aside, it's a clear commandment from our Lord to be aligned with him in this way, and it's something we strongly urge you to consider as a Christ-follower. 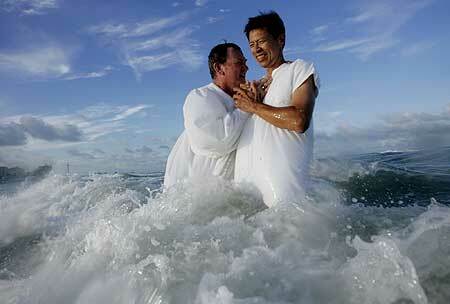 Our next baptism service will be Sunday evening at Sawgrass Beach Club. It's going to be a beautiful setting to invite family and friends to hear stories of God's great love. Join us at 6:30pm. Directions are here. See you then! Last time Access met, Andy Stanley gave one of the best explanations of baptism I've ever heard. Some of you missed it and have asked to see it, so here you go! If, after watching the video, you would like to be baptized, give us a shout. We're planning a baptism service at the beach on August 24. We'd love to help you celebrate God's work in your life in front of family and friends.